The 1st of July, 1990 was registered Lease holding company "Zvezda" which in 20 years grown from a small enterprise in the largest Russian manufacturer of plastic scale models and board games with an annual turnover of more than 300mln. rub. According to the experts "Zvezda" controls 75% of the market for unassembled models. According to marketing agency Step by step, Zvezda is the largest Russian player engaged in the production of board games (the magazine "Dengi" on August 20, 2007). Under the brand name "Zvezda" annually produces more than 500 types of products. The company produces more than 80 new products per year, which are successfully sold in all regions of Russia and more than 50 countries. Over 19 years of Zvezda has earned recognition and credibility in the international market. It is the military-historical miniatures and assembly models of good quality and cheap in comparison with foreign analogues, quickly found a buyer and allowed the company to find its niche in the market, which "Zvezda" continues to develop successfully and now. Today Zvezda annually produces more than 50 new products only in the main direction – scale plastic models and historical military miniatures. Technical reliability of models provided by the cooperation with leading local design offices, the accuracy of historical military miniatures by the deep study of the historical material. Zvezda is associated in the world market as a proven brand with consistently high product quality and quite low prices. Since 2000 " Zvezda " has been successfully developing a promising trend, as board games for the whole family, including the licensing of the game "Shrek," "Ice Age," "Charmed", "Good night, kids", and a lot of games under license from "Disney". Board Games for the whole family - fun and educational entertainment for all ages. Today the "Zvezda " produces more than 80 board games. Zvezda scale plastic sets - the strategic direction of the company. 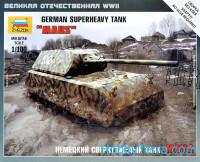 MAIN LINES: Military vehicles kits by the Second World War (the Soviet and German) in scale 1/35. Subject line includes plastic models of military equipment and supplies, consisting of figures. Modern military equipment, since the Afghan war to the latest contemporary designs. Airplane Model Kits. Following tradition, these models are mainly produced in scale - 1/72. Subject line includes aircraft scale models of the Second World War, modern aircraft and helicopters. Model ships. Thematic series of very broad: it has a model of the " Karthagische Galeere " (V-IV centuries. BC) to modern Russian nuclear submarine "Kursk". 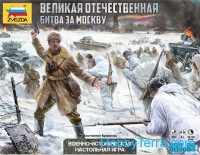 Zvezda scale plastic military and historical miniature. The sets consist of plastic figurines, models of real historical warriors of different armies in the world and different eras. Figures are chosen so that one can form a military compound. These Zvezda’s plastic sets represent the main stages of military history. German heavy assault gun "Shturmtigr"
German Heavy Tank Destroyer "Jagdpanther"